The global tourniquet market is known to be extremely dynamic and highly competitive, marked by the emergence of several players globally. The major players leading in the market include Zimmer Biomet Holdings, Inc., Stryker Corporation, and ulrich GmbH & Co. The former two players are based in North America region. Some of the key palyers operating in the market are Delfi Medical Innovation, Inc., Pyng Medical Corporation, VBM Medizintechnik GmbH, and Hammarplast Medical AB. Various companies in the global market are working upon developing immensely functional tourniquet cuffs and systems. They are also emphasizing on improving their product portfolio to get an edge over their peers. The advent of reliable and safe systems, embedded with automatic control, is prognosticated to strengthen the competition in the global tourniquet market in the forthcoming years. Moreover, the emergence of disposable tourniquet cuffs is shaping the vendor’s landscape as well. According to Transparency Market, the global tourniquet market is foreseen o expand at a CAGR of 9.3% within the forecast period from 2015 to 2023. In 2014, the market was worth of US$184.6 million and is likely to soar around US$408.6 million by the end of 2023. Based on product type, the global tourniquet market is segmented as tourniquet cuffs and tourniquet system. Among these two, the segment of tourniquet cuffs, the sub-segment of reusable tourniquet cuff is likely to lead the market due to high popularity. This is attributed to its durability, reusability, and affordability. 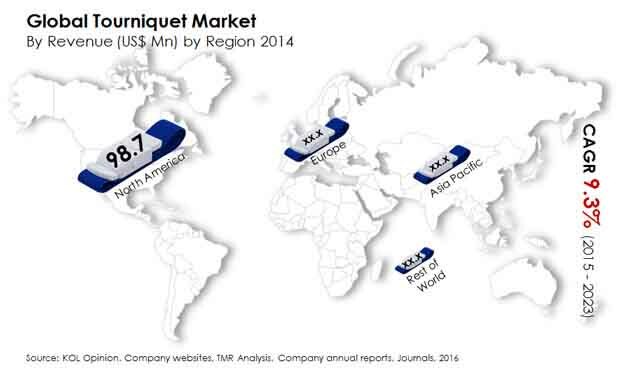 Geography-wise, in 2014, North America region dominated the global tourniquet market with maximum share of 53.5%. The lead of the region is credited to the significant rise in the healthcare infrastructure to treat traumatic orthopedic wounds. The increasing cases of serious limb injuries, combined with the squeezing requirement for a proficient blood occlusion methods, is a major factor pushing the demand for tourniquet cuffs and frameworks. The expanding rate of road accidents and industrial mishaps that causes huge blood loss has accelerated the requirement for these gadgets for a quick flow of blood. The rising death rates of street mishaps in different areas, particularly in developing countries, has reinforced the take-up of tourniquets in emergency units and medical clinics. These frameworks are picking up pace as the initial source of treatment for various urgent orthopedic wounds occurring due to road accidents. The surging number of possibly serious hemorrhage is foreseen to stimulate the demand regarding tourniquets for alleviating the exsanguination risk. Also, rapid advancement in technology made in traumatic centers, especially in rising economies, for example in China, India, and Philippines, is a key factor foreseen to highlight the tourniquet market in the forthcoming years. The rising instance of diseases related with the utilization of reusable tourniquets has hampered the market to a certain degree. Moreover, the absence of familiarity with the utilization of cuffs and tourniquets is another key factor expected to upset the market. In any case, the increasing healthcare expenditure in several developing and developed countries on providing their trauma centers with latest blood occlusion methods is a major factor estimated to open up major development roads along the coming years. Moreover, the approach of advanced frameworks that can give blood occlusion in different severe climate conditions is estimated to provide lucrative opportunities for market players.